When you place your loved one into a nursing home, you are trusting that facility to give them the attention and care that they need. When you find out that those needs aren’t being met or that your loved one is suffering abuse by the very people you needed to trust with their care, it is devastating. Nursing home abuse can take many forms, from neglect to financial scams to physical, mental or sexual abuse. 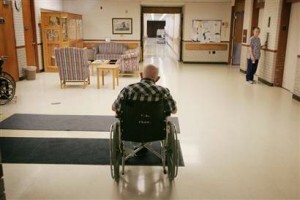 If you or a loved one has suffered these abuses at a nursing home in the Louisville or Lexington areas, you need to call the Sciantarelli Law Firm. Many nursing homes will try to get you to sign papers releasing them from liability for the abuse, or they’ll try to quickly cover up the issue. However, nursing home abuse isn’t something that your loved one will get over easily, and they may require additional care during their recovery and subsequent care. You and your family shouldn’t suffer the financial repercussions of the abuse and later care that is required to help your loved one. Kevin Sciantarelli is a nursing home abuse attorney that will fight for your rights to compensation in order to help your loved one recover and get the care that they need. Because Kevin Sciantarelli personally handles all of the nursing home abuse cases that come into his Lousiville and Lexington offices, you can feel confident that your case is getting the attention that it deserves. You won’t be pushed off onto an inexperienced junior lawyer like you would at a bigger law firm. Kevin and his team will devote their time and energy to fighting for your loved one and helping them get the compensation they need to get the quality care that they deserve. Call the Sciantarelli Law Firm at 1-855-835-8823 and get a free consultation from our nursing home abuse lawyer today.